What causes foundation failure? Know what is causing your problems before it’s too late. Understanding the causes of foundation problems will not only create a safer environment but may save you money in the long run. Are your trees too close to the foundation? Do you have drainage problems or plumbing leaks? Is it possible you have expansive soils? By knowing what causes the problems you may be able to prevent problems from occurring. ECP is dedicated to providing the most extensive information about structural repair issues and their comprehensive solutions. 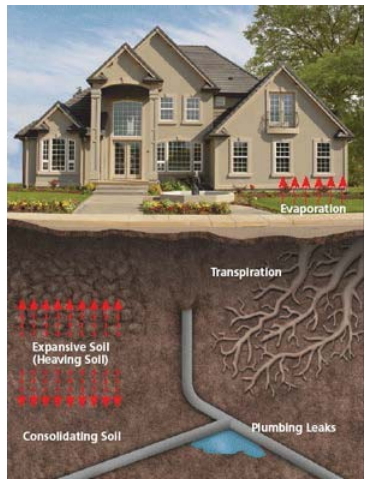 Improper drainage will lead to excess moisture build-up, which could erode or consolidate soils. Excessive moisture may cause heaving of expansive clay soils. Cut and fill situations, where the soil is removed from part of the building site and stacked on another, needs proper soil stabilization before a structure is built; otherwise unexpected movements of the soil beneath the foundation may occur. Cut and fill situations should be properly prepared before the structure is started or it may result in improperly compacted soil beneath the foundation. Poor soil, organics, debris, etc., may cause expansion or consolidation, which contribute to foundation failures. Using the correct foundation repair system can counteract the above conditions. Steel piers and helical piers are often the solutions for your basement or foundation. The causes of foundation failure require you to protect your largest asset with the highest quality piering and basement wall repair products. These piers need to be installed by underpinning experts that have been trained by our staff. Insist on foundation repair products designed and engineered to perform by ECP.